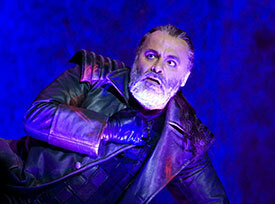 ABOVE: Paolo Gavanelli in the the title role of Nabucco. INSET BELOW: Daniela Sindram as Fenena. After a less-than-stellar debut and the failure of his second work, Un Giorno di Regno, Verdi had decided to give up composing. Bartolemeo Merelli, impresario of Milan's La Scala opera house, handed him a libretto (which had already been turned down by another composer) and wouldn't take "No" for an answer. The first Munich performance of Nabucco took place on October 5, 1852, and the opera's most recent production had its debut on January 28, 2008, on the Bayerische Staatsoper's Nationaltheater stage. I was lucky enough to attend Nabucco in February, 2008, and the performance (which played to a packed house) was a wonderful night of opera. In this article, I'll quickly describe Nabucco, comment on the Bayerische Staatsoper's production, and point you to related information on the Web.